Increase productivity and creativity with the perfectly designed workspace. 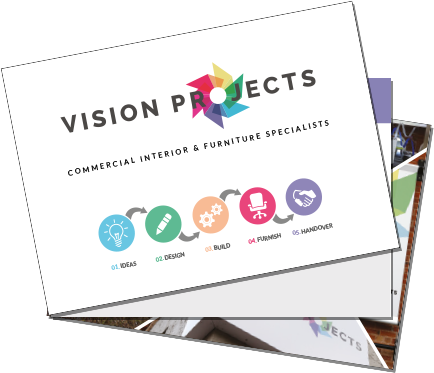 Allowing you to get the best possible idea of how your fit out and refurbishment could be completed, Vision Project’s design process is professional and highly adaptable to all environments and workspaces. - Client meeting to establish the client’s requirements and project objectives. - Survey the current environment and understand the working practices. - Formulate and adapt the brief with the client. - If the proposed area is a new space / building a visit is undertaken to evaluate the space. - Advice is offered on current working practices. - Talk to key staff to understand the departmental relationships and culture. - Define the space and its use. - Identify and consider ancillary spaces. - Identify the building constraints in relation to the clients needs. - Establish project concept and image. - Determine areas requiring special attention. - Detailed departmental needs and image. -Present to client and gain approval to develop the scheme. - Develop block plans into detailed space plans. - Ensure scheme is fully compliant. - Client sign off on space plans. - Understand and implement company branding and image. - Sketch visualise key areas. - Present colour and finish ideas. - Present to client and gain agreement to develop the scheme.